20120517 - Up and at the desk getting things done and lined up to be caught up soon. Dad called today and we talked for a short time. He is in an incredible amount if pain, I guess you would be after being sawed open... Finished up and went out and threw the football with J&G. 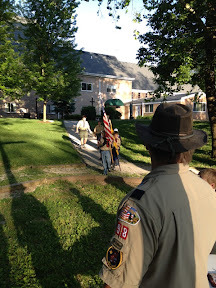 We ate a quick dinner and then headed to the final Pack meeting on the season where my Wolfs graduated to Bear Scouts. LD&G went with us and D helped with the ceremonies and G played on the play ground as we had the meeting out back in the open air sanctuary. After the meeting we went to Blockbuster and the bank. Home and all boys to bed. I says up and watched the new Underworld movie.